When I came across Aroma Crystal Vibrational Therapy, I knew I had found a company that was right up my ally. This is a company who describes their products as “made with love”. All their products are made with 100% pure essential oils and plant extracts with no harmful chemical additives like parabens or sodium lauryl sulphites. For my sensitive skin, I prefer to use products that are natural and who wouldn’t want to use a product that is made with love. What a nice concept! Vibrational Science is said to have a multitude of benefits including boosting the immune system, reducing inflammation and repairing damaged skin. I’ve been working with my crystals along with my reiki for a few years now and understand that the healing properties that these precious stones possess. 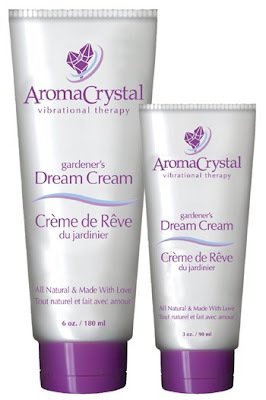 I found it very interesting to learn that Aroma Crystal Vibrational Therapy (hence the name!) uses Quartz crystals to amplify, focus and enrich the energy of their products. This will infuse them with a healing energy and make them all the more powerful and effective. 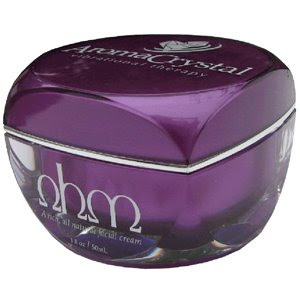 Aroma Crystal’s product line includes the best-selling Gardener’s Dream Cream, Ohm Facial creme, Morning Dew Moisturizer, Crystal Clear Face Wash, and Outdoor Eazzz Aromatic Spray. These products can be purchased online at the Aroma Crystal website or you can search to find a retailer near you. Aroma Crystal sent me Ohm Facial Creme and Morning Dew Moisturizer for my review. The Ohm Facial Creme contains geranium, lavender, palmarosa, chamomile, juniper and carrot seed with each having their own benefits to your skin. Some of its benefits are to replenish the skin, help prevent the look of aging and soothes dermatitis to name a few (there are many more). It is a 1.8 oz for $33.30. I tried it out and thought it was really moisturizing and felt good on my skin. However, I wanted to get my mom’s opinion since her skin would benefit from it more than mine since she is more concerned about aging and wrinkles and all that fun stuff! It will be my turn soon I know, but I like to get a second opinion sometimes when doing my reviews! My mom thought it was a great product and she found it did make her skin feel soft and smooth and reduced the dryness feeling that she gets in the winter. She said she would use it again and felt the price to be on par with other beauty cremes on the market. She liked the unique concept of the creme using vibrational science in its creation. The Morning Dew Moisturizer was my favourite out of the two products. I thought the smell was phenomenal and loved how easily it absorbed into my skin. It didn’t leave a greasy after feeling that you often get after putting on a moisturizer. It made my skin feel really soft and smell fantastic! It contains sweet orange, lavender, geranium, palmarosa, carrot seed, jojoba, and poppyseed and comes in a 4 oz bottle for $21.50. Its benefits include improving the complexion, reducing eczema and scarring, and helps to prevent the look of aging to name just a few. I think Aroma Crystal Products are excellent, love the healing properties they possess and fully recommend them! Thanks to Aroma Crystal for the opportunity to review these two amazing products!